HP ENVY is currently the most powerful desktop series manufactured by Hewlett-Packard. This series actually has a long list of line-up featuring only fast-performing machines promising excellent computing experiences. One of the fastest models available is the HP ENVY Desktop – 750-630xt; the default components attached are probably more than enough to deliver extreme speed, yet the company still offers some expandability options or upgrades on the purchase. In general, it has a menacing appearance from the outside and an impressive component combination in the inside. The customizable HP ENVY is available with a starting price at $1049. However, with special deals and offers, the price may be either increased or reduced. As previously mentioned, HP ENVY is an expandable desktop as the manufacturer offers a good deal of upgrade options. The stock specifications are quite impressive actually; they include a latest 7th Generation Intel Core i7 processor, 16GB DDR3, and 3TB HDD hard drive. It also features NVIDIA GeForce GTX 1070 8G by HPI Graphic Card, SuperMulti DVD Burner and Wireless-N LAN card. All the mentioned components can be either upgraded or downgraded depending on each buyer’s preferences. Of course, this will heavily affect the total price. As a matter of fact, with some deals and offers, HP allows consumer to save up to $400. Liquid cooling system is as well attached to ensure that the processor works to its full potentials. There are various upgradable components such as graphic card, hard drive, memory, and even the operating system. The good thing is that consumer is allowed to customize the HP ENVY desktop before the purchase; the company will do the entire customizations and adjust the total price. Some additional items are as well offered; it means consumer may purchase various items as a bundle. Along with the purchase of this desktop, buyer may include a variety of electronic products including monitor, speaker, printer, and NOOK e-book reader. The top most configuration after upgrades will include Windows 10 Pro 64, 16GB memory, NVIDIA GeForce GTX 1070 8G by HPI graphics card, 3TB hard drive, a secondary hard drive (3TB capacity), a secondary optical drive, and more. Useful software is included in the bundle, but consumer can always opt not to purchase the software to reduce the price. With the mentioned specification configuration, HP ENVY can be an excellent choice for gaming. As probably guessed, a gaming desktop should also perform well when used for other computing activities. Another good thing is the design; it allows user to easily add new components such as a hard drive. The ports are also well designed to allow user to conveniently plug in USB drives, headphones, and MP3 player. The bundled software is nice addition; it includes DIB SW Roxio Secure Burn US, DIB SW CorelPaintSPPX9+RoxioCreatNXT5, and DIB SW Laplink PCmover Professional. – The Price: a great computer comes with a great price. An HP ENVY desktop with its stock components is available at $1,199; with all the upgrades, the price may greatly increase. – Availability: The entire features and components promise excellent computing performances, but HP clearly states that the availability of features varies by country. 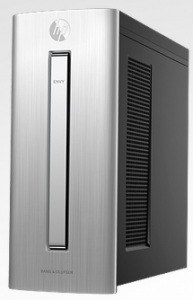 In general, HP ENVY Desktop – 750-630xt is an excellent choice for gamer. It is a high-performance desktop featuring impressive hardware component that will handle even the most demanding games smoothly. With or without upgrades, it will also be a great computer for almost all purposes including business and graphics designs.